Provides 500 gold per day. It is required before you can build any other town structure. Provides 750 gold per day. Provides 1000 gold per day. Builds a level one city wall. It is required to build 1st level creature dwellings. Builds a moat and level two city wall. Builds a keep and level three city wall. Allows the recruitment of heroes. Sells the Telescope (500 ), Mage's Staff (1000 ), Chain Mail (500 ), and Potions of Restoration (500 ), Immortality (1000 ), Cold (500 ), Fire Resistance (500 ), and Binding Liquid (500 ). Requires: Fort, A body of water is required near the town. Build ships, and allows caravans to travel across bodies of water. Teaches 3 Level One Order Magic spells. Heroes who visit regain up to 35% of their spell points. Heroes who spend the night recover all of their spell points. Teaches 3 Level Two Order Magic spells. Heroes who visit regain up to 50% of their spell points. Heroes who spend the night recover all of their spell points. Teaches 3 Level Three Order Magic spells. Heroes who visit regain up to 65% of their spell points. Heroes who spend the night recover all of their spell points. Teaches 2 Level Four Order Magic spells. Heroes who visit regain up to 80% of their spell points. Heroes who spend the night recover all of their spell points. Teaches Life Magic spells. Depending on the level of the mage guild, it teaches 2 spells each for levels One, Two and Three and 1 spell each for Levels Four and Five. Teaches Death Magic spells. Depending on the level of the mage guild, it teaches 2 spells each for levels One, Two and Three and 1 spell each for Levels Four and Five. Generates Golems. Building the Golem Factory prevents the construction of the Mage Tower. Generates Magi. Building the Mage Tower prevents the construction of the Golem Factory. Generates Nagas. Building the Golden Pavilion prevents the construction of the Altar of Wishes. Generates Genies. Building the Altar of Wishes prevents the construction of the Golden Pavilion. Generates Dragon Golems. Building the Dragon Factory prevents the construction of the Cloud Castle. Generates Titans. Building the Cloud Castle prevents the construction of the Dragon Factory. Provides an extra 10% gold per week. Teaches the basic level of 4 skills for 2000 gold each. 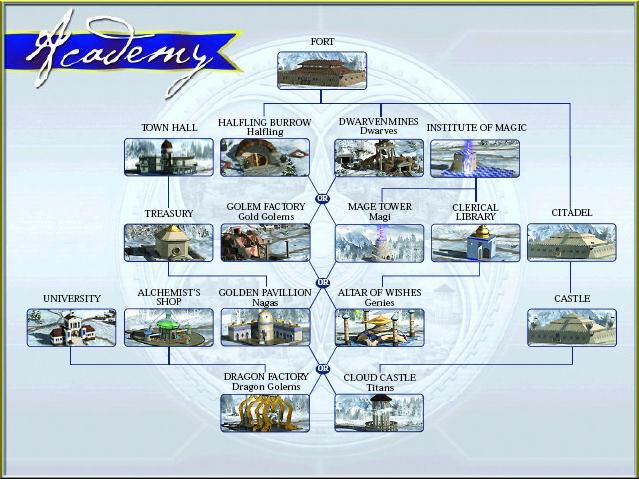 Skills are chosen from the secondary skills for Nobility, Scouting, Life Magic, Order Magic, and Death Magic. Provides 3000 gold per day. Also, the strength of all Order Magic spells are increased by 50%. All Institutes of magic for this player contains spells as if they were Level 5. A hero who stays in a town with an Institute of Magic can exceed his/her normal spell points limit by 25% for every level over a Level 1 Institute of Magic. and to Djive (Heroes Community Moderator) for combining it with the HTML layout.